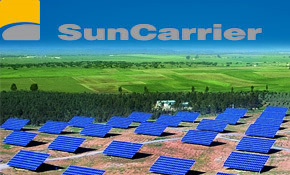 SunCarrier, a division a+f GmbH, a company in southern Germany, has been researching Kansas City and the region as sites for installation of their solar technology. Marc Reimer, Head of Project Development, explained that his company has been a leader in solar technology and efficiency for six years with a new fashion of solar installation that has shown great success in Germany and Spain. They now seek to try that same technology in what he terms as “less than optimal conditions,” namely the winters of Midwestern United States. Germany has become the world’s leader in solar technology since its beginnings in the early 80’s and with dramatic growth happening at the end of 1990 after the creation of major incentives from the German government that made solar products “financially very interesting” according to Reimer. Germany, like many countries, uses a system called “Feed-in Electricity Tariffs” to encourage the use and creation of new energy technologies by paying subsidies, in differing amounts dependent upon which renewable source from which the energy is created, to the utility companies, who are then obligated to buy power created from those sources of energy. Reimer explains that producers of power from renewable sources, including both industry and private residences, sell their power to the electrical “grid” thus recouping the cost of the initial investment which typically takes just 8-10 years, even without incentives in place. With energy costs rising at a level of 10 percent each year for the last 10 years, the creation of power from alternative sources is very attractive. Reimer believes that even without the incentives people will gravitate increasingly toward installing renewable energy creation technologies; because after the initial investment is recovered it is all “free energy,” except for the maintenance. SunCarrier has created a new more efficient solar technology with a much smaller geographic “footprint” and it works both differently and better than traditional solar capture methods. Reimer explains there are two philosophies with “tracked” systems: single axis and dual axis. SunCarrier utilizes the single axis system which he describes as “completely reliable.” Their technology turns on an east to west track “axis” to best capture the sun’s rays regardless of the season making it 35% more productive than fixed systems. During the night hours it, very slowly and with great efficiency of energy consumption, spins back to its starting position using an electronic clock to move the system precisely into place based on solar movement patterns. Additionally, their system has been built to withstand the conditions of high wind and snow load that are the most difficult for tracking systems to stand up against. The focus for SunCarrier, Marc relates, is not looking at their short term ROI, but in that they produce energy in the worst weather and do so for decades, 20, 30, 40 years, with only upkeep costs after installation cost recovery. Germany’s experience has been already been replicated in Spain, a primary solar market, which followed largely the same pattern as Germany with incentives as well as Spain have a similar availability of raw sunlight that is also comparable to here in Kansas. Both Germany and Spain are on target to have 20% of their energy needs met by renewable sources by 2020, putting them way ahead of the U.S. and it is already a 235 billion (Euros) industry in Germany creating a large number of jobs. With a 235 billion (Euros) industry creating those alternative energy “green jobs” so much the hot-topic of conversation here in the U.S., can German and Spanish style incentives be far behind? Reimer believes no. He also believes the most likely source for those incentives will be state governments rather than the federal level and many states are already doing so. States are best placed to move forward with the environmental and health based initiative dollars that will bring technologies like theirs quickly into place, according to Marc. Where do Kansas and the Midwest fit into this you may ask? Isn’t this technology best suited for the deserts of Arizona and California? Reimer says yes and no. First, yes, for optimal weather conditions, the desert is the obvious choice; they already have experience in Dubai and the Middle East. However, there are, in SunCarrier’s opinion, great reasons for being here in the Midwest. First, the competition is not comparable to those areas. Second, they want to be able to show what their technology can do in difficult weather conditions including heavy snow and wind loads. He says those organizations in Kansas City, Lincoln and Omaha have been very receptive to both the idea and their technology and SunCarrier has been impressed by their receptiveness. He says they have several options for their first installation in the region and already have crafted a team of partners. Their legal team is Husch, Blackwell and Sanders of Kansas City and they have supplier and subcontractor relationships established. NPPD (Nebraska Public Power District) in Norfolk, Nebraska is the probable site of their first regional installation. They have also met with other utilities including OPPD (Omaha Public Power District) as well as product developers at private companies like Chevron, who is a worldwide player in solar. He says they have been in close contact with U.S. manufacturing like Baylin Manufacturing in Columbus as well as Wellman, Inc., and their modules will most likely be purchased from Sun Power in San Francisco. Many people are surprised by the idea of solar power generation in Kansas; after all, wouldn’t wind be more likely? Reimer explains that solar and wind are not in competition for the creation of renewable energy; in fact, they are highly complementary systems. In fact, he explains, those who currently have wind generation systems connected to the grid make ideal candidates for adding solar generation. The systems work separately but effectively side-by-side and don’t meet the energy needs all alone. Wind is most efficient at night and during bad weather when solar is not available. Yet, the highest energy demands come during times when it is not windy. Wind is absent specifically when it is hot and clear with lots of sunshine present and our energy consumption demands sky-rocket due to the twin needs of air conditioning and refrigeration. Even without those high pressure calls for power, our energy usage is typically at its highest during the morning and late afternoon, precisely when solar tracking provides the most wattage. Wind is, by its very nature, difficult to predict yet there are long-standing, predictable solar tracking models to use for creation of calculations for solar energy production. Finally, he points out the advantages inherent in solar as compared to wind, first and foremost being the environmental advantages with wind having a higher negative environmental impact on a number of fronts. First, visually wind towers impact the environment by standing typically 200 feet or more in height; second, the turbines create shadings from the blades; third, the noise created by the spinning turbines is often cited as a deterrent; and fourth, the maintenance is much more intense on the wind structures. The turbines are typically not found in areas where cranes that can reach 200 feet, as required to do the repairs, are located so they have to be transported in resulting in much longer downtimes, plus at costs approaching $250,000 (USD) for repairs. Contrast that to, if there are issues solar can be back up and producing with less than 3 hours of repair. This points to another advantage of solar. Namely, the technology can be put into place in 2 to 3 weeks in order to create two megawatts of power; a huge advantage for an energy dependent and cost sensitive public. A big dollar industry creating thousands of good-paying jobs using parts from American manufacturers resulting in the creation of renewable energy reducing our dependence on foreign sources of fuel that contaminate our planet? 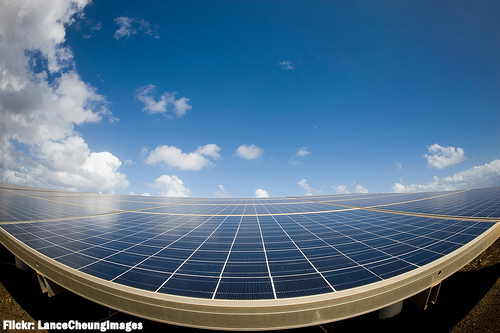 It sounds like solar is a match made in the heavens yet within our grasp.